Try Dr. Kurtzman's dental office for dentistry done differently. The big waiting rooms full of people, waiting and waiting for the dentist, everyone in a hurry, the dentist pops in for a minute and is gone to the next patient – it’s enough to make you nuts. You feel like you are on a conveyor belt in a big machine and nobody is paying much attention to your wants and your needs. This is many people’s experience of going to the dentist. When you step into our dental office you will notice the difference. The environment is elegant, calm with open architecture and soothing colors – all designed to help you feel comfortable, relaxed and welcomed. You are our top priority, so we don’t schedule overlapping appointments or rush you through a consultation. We get to know you, we listen to your dental health goals and we help you achieve the healthy, beautiful smile you have always wanted. We work hard every day to live up to the ideals of our treatment philosophy. Dental care is an extremely individualized and personal service. Each of us has our own idea of ideal health and beauty. We view each person’s care and treatment as a work of art and science. We mix our exceptional skills with the technology needed to create the best possible results. Our Atlanta dental practice offers a wide range of dental services and we care for the most sensitive dental patients. Our joy in dentistry is the facilitation of good health with people who enjoy and value their health and our excellent care. For a modern, pleasant dental experience, contact Dr. Kurtzman today. If you “just don’t like the dentist”, we can help you. Dr. Kurtzman has built his practice on doing dentistry differently. 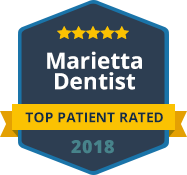 If you want your next trip to the dentist to be a pleasant one, call or contact our Marietta dentist office today.